GAINESVILLE, Fla. – Veronika Kanuchova has a penchant for performing at her best when it matters most, and Florida State’s senior hammer thrower had an opportunity to prove it once again Saturday morning at the Florida Relays. Leading the invitational section since the third round, Kanuchova had only seconds to compose herself when Virginia Tech’s Pavla Kuklova sixth and final attempt pushed her into second place. It wasn’t the first time the All-American from Slovakia had been in that position … and responded. Kanuchova’s final round throw of 65.42 meters (214-7.75) banished Kuklova (64.66m/212-2) to a runner-up finish, in a repeat of their 2017 ACC Outdoor Championships showdown and conclusion. Kanuchova’s path to a second consecutive win, after sitting out the 2018 season as a medical redshirt, was distinctly different. At last week’s FSU Relays she recorded only two legal throws in six attempts; one to get into the finals, and the other for the win. Saturday she landed five of six, including the winner. Junior transfer Nadia Maffo recorded the second-best mark of her collegiate career, placing fourth with a throw of 61.66 meters (202-3.75). In the process she moved to No. 3 on FSU’s all-time list in just her second meet. It wasn’t the only new top-10 mark registered by the Noles as the three-day meet drew to a close. 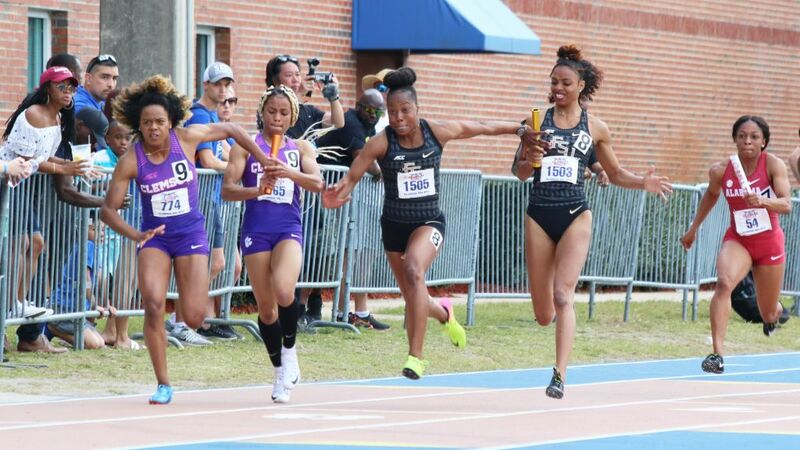 The women’s 4×100 relay team of Karimah Davis, Shauna Helps, Cortney Jones and Ka’Tia Seymour finished fourth among college teams, finishing in 43.84. That’s the No. 8 performance in FSU history; impressive considering it was the first time the group had worked together. 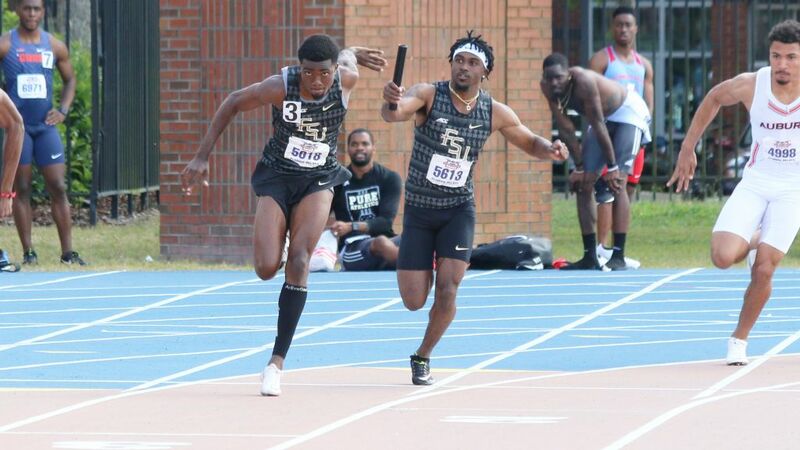 Coach Rick Argro sent his own first-time men’s 4×100 relay team to the track and the quartet of Darryl Gay, Jhevaughn Matherson, Michael Timpson, Jr. and Andre Ewers delivered. The Noles finished second to host Florida among college teams in season-best 39.21. Rounding out the remaining performances of the day, junior Sanjae Lawrence finished third in the college section of the shot put (17.66m/57-11.25), while sophomore Jacore Irving record a new triple jump personal-best (15.19m/49-7) in his season-opener in the event. Kayla Maczuga capped the weekend by matching the second-best high jump clearance of her career (1.70m/5-7). While most of the east coast was sleeping Friday night, Florida State senior Militsa Mircheva was taking down another school record at the Stanford Invitational. Mircheva shattered the 15-year-old 10,000-meter mark held by Vicky Gill, finishing in 32:30.07, which also set the Bulgarian national record. Capping a remarkably steady pace through the first 24 laps, she closed with her fastest lap of the night to place 15th overall in the field; sixth among NCAA Division I runners. Shortly after Mircheva climbed from fifth to first on FSU’s all-time list, freshman Elizabeth Funderburk made her track debut for the Noles in the second session of the 10,000. Running like a seasoned veteran in her first time in the event, the Moultrie, Ga. took over the No. 6 position on FSU’s all-time list with an eye-opening time of 33:31.05. She currently holds the nation’s top time at the distance for a freshman and is the only underclassmen on FSU’s top-10 list.